The OP250 is a configurable stabilized light source available with a variety of LASERs or LEDs. Offered in a single or dual port configuration with selectable wavelengths, various power levels and industry standard optical interfaces. 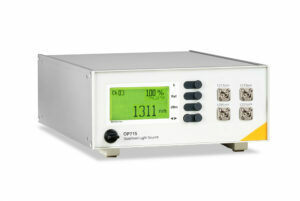 The OptoTest OP715 Benchtop LED/LASER Source can be configured up to 4 channels with a mix of LEDs and/or LASERs. Ideal as a compact, stand-alone source or used in conjunction with an optical power meter to measure insertion loss. Factory configurable wavelength mix including LED and LASER. The OP750 multichannel source can be configured with a mix of up to 24 individual or switched LED or LASER sources. Single wavelength LED source, available in 850nm or 1300nm, features an internal large core fiber to guarantee an overfill condition for 62.5/125µm or 50/125µm multimode fiber.